Are the pyramids and tombs in the same place? Here are the answers to your 3 most popular geography questions about Egypt. Take a look at the world map below. 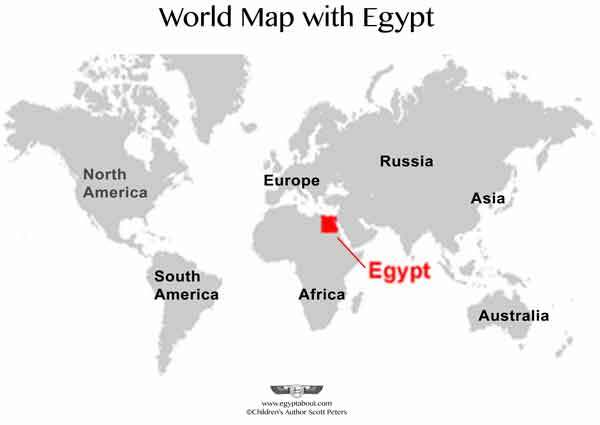 As you'll discover, Egypt is located beneath Europe. It's on the Northeast side of Africa. To reach the African continent from Europe, one can cross the Mediterranean Sea in ships the way Julius Caesar did on his trips to visit Queen Cleopatra. While the northern shores of Egypt lie on the Mediterranean Sea, it's eastern shores are situated along the Red Sea and the Suez Canal. The country shares a border with the Palestinean Territories, Israel and Jordan. If you travel to the bottom of Egypt, you'll arrive at the southern border where it meets with Sudan. If you travel west, you will arrive at the border of Libya. 2. Where are the pyramids? The pyramids are found in the North of Egypt, nearest to the Mediterranean. It's known as Lower Egypt, which can feel a little bit upside-down when looking at the map. 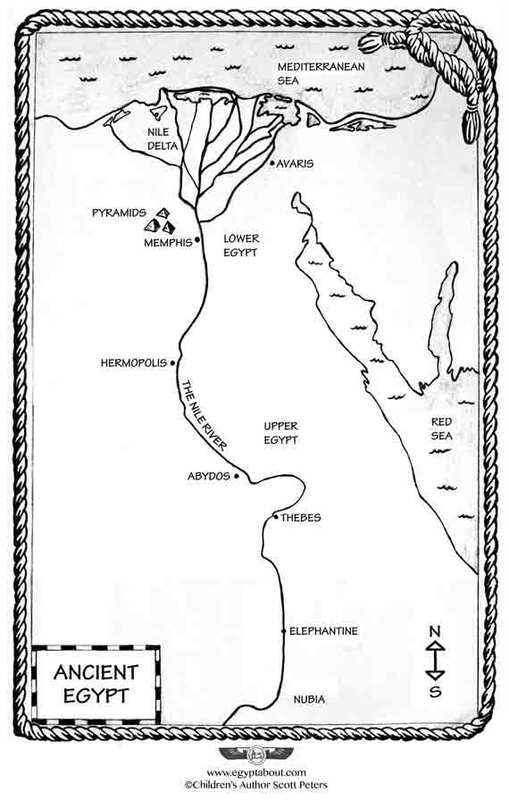 The reason it's called "Lower" Egypt is that the Nile flows North (upward on the map). Water always flows to its lowest point, which is the Mediterranean sea. Thus it is called Lower Egypt. If you look closely at the map, on this northern end the Nile breaks into many rivers, also known as tributaries. This is called the Nile delta. The delta soil is rich and fertile because so many nutrients from upstream have been deposited there. Just before you reach the Nile Delta, you will notice the pyramids. There you'll find necropolis of Saqqara with Djoser's Step Pyramid (3rd dynasty) and the nearby Giza plateau, with the Great Pyramid of Giza, the Spinx, the pyramid of Khafre, and others. The nearby town was called Memphis. During the Old Kingdom, Memphis was the capital of Egypt. The remains of Memphis are 12 miles from Egypt's current capital, the modern city of Cairo. The close-up map below shows the geography of ancient Egypt's Nile Delta at the Mediterranean Sea, the pyramids, and the Valley of the Kings (site of the tombs). 3. Where is King Tut's tomb? 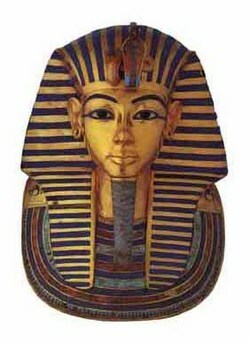 King Tut, also known as Pharaoh Tutankhamen, was buried in a tomb in the Valley of the Kings. This valley is in Southern Egypt, also known as Upper Egypt. On the map above, follow the Nile south and you'll see it on the left. The nearest town was called Thebes. Today it goes by the name Luxor. You can also see that near the Valley was a village called the Place of Truth. The craftsmen who built the tombs lived there. They kept detailed records of their daily lives, which can be read today. The remains of the village are still in existence. Locals call it Dier el Medina. 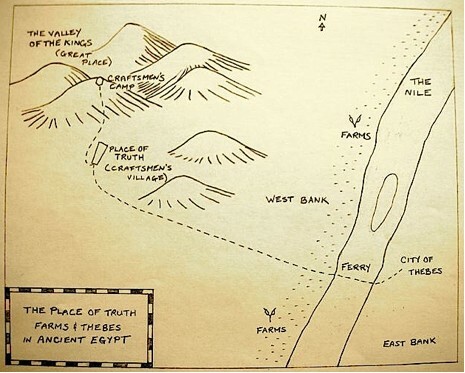 This close-up map below shows Ancient Egypt's Nile Valley, the Valley of the Kings (burial place of King Tut), the Place of Truth (craftsmen's village where tomb builder's lived), and the city of Thebes. You are free to share this image but must provide a link to this page.